How do I even begin to describe my love of Palm Springs? If you've been following for a while, you know this is my second time to Modernism Week, but I believe my 13th or 14th trip to Palm Springs. I simply cannot get enough of the palm trees & mountain views, plus spending time with my grandparents ranks high on my personal List of Fun Things to Do. And, because we live in the frozen tundra of Michigan, escaping to 80* and sunny in the middle of February is basically like wining the lotto. My grandparents are what bring me back to Palm Springs year after year. My first trip was at five years old, and since then, I've been with my cousins, my immediate family, and high school friends on various trips. Last year I finally had the opportunity to take Greg - we had a wonderful vacation! 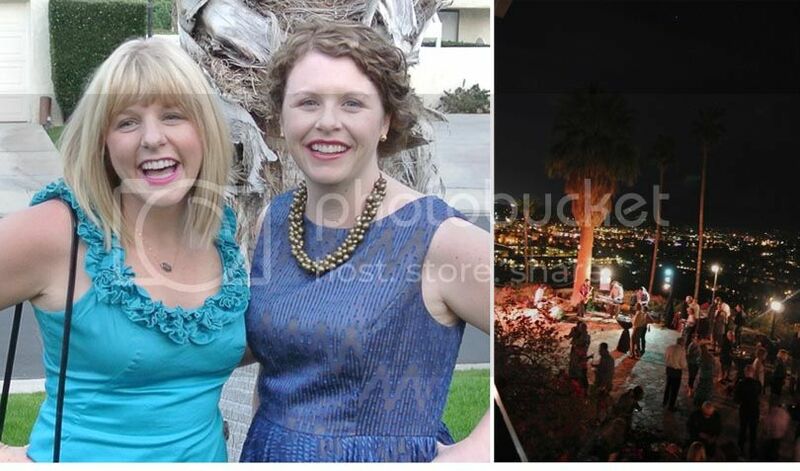 In November, my sister Victoria and I started planning a visit to our grandparents and take in Modernism Week. After planning for a couple of days, we invited our mom and other sister, Jackie, along with us. I was able to fly out a few days before the three of them and spend a couple of days solo with my grandparents. 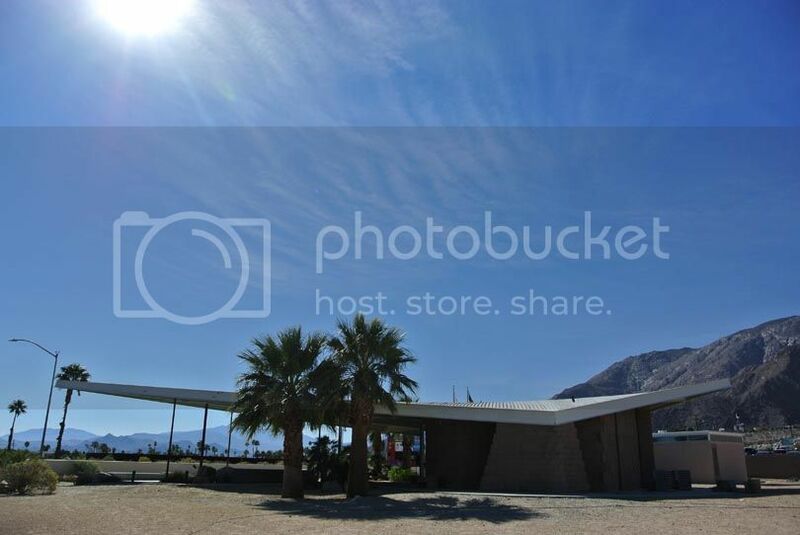 The photos above were taken right after we saw the Palm Springs Follies. I loved the music, the dancing, and the company, and since it is their final season, I was so happy I was able to attend! Grandma also took me to see Saving Mr. Banks, a movie I've wanted to see since it released in December. I laughed & cried through the entire movie - I seriously loved it! It's set in 1961 in Los Angeles - the sets, cars, and clothing are simply gorgeous! 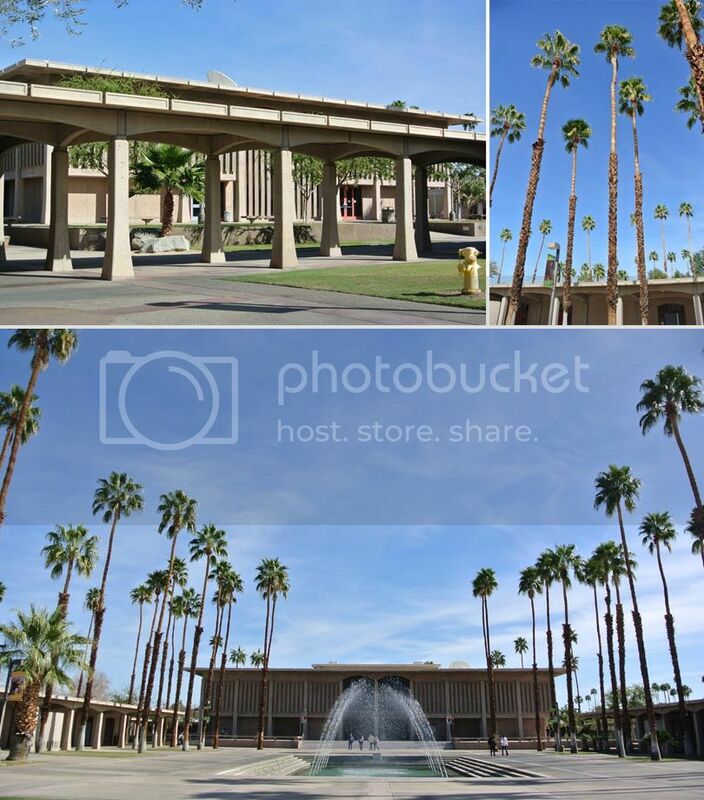 Thursday before my mom & sisters arrived, I took a walking tour of the College of the Desert with local Palm Springs architect, Lance O'Donnell. After visiting the college in the 5th grade, I entertained the idea of attending here, but alas, the community college wasn't a perfect option for me. The tour was wonderfully lead, and it was fun learning more about the history of the buildings and the future of the local college. Victoria, Jackie & my mother arrived later in the week, and Friday we all went to Los Angeles for the day. We spent a majority of the day in the jewelry district, and while I tried on a ton of pretty things, I walked away with nothing new. 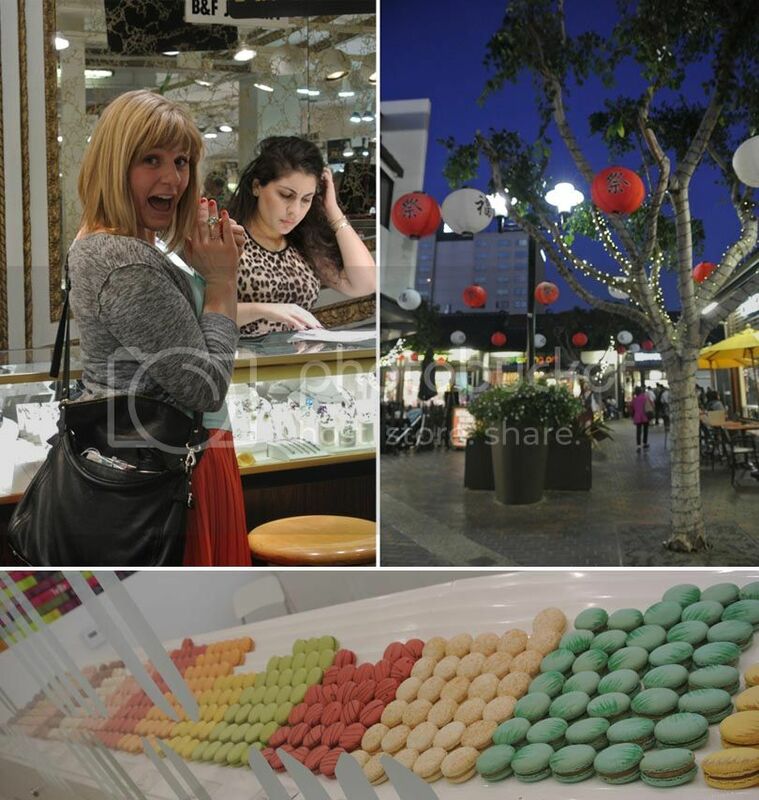 In the evening, we headed over to Little Tokyo, grabbed ramen for dinner, and had a couple of the best macaroons I've ever tasted at 'lette macarons. Saturday we woke up and headed to our first home tour - Sunmor Estates. What an amazing tour it was - 13 homes were open officially, another let us in because I think they wanted to be a part of it, one was for sale so we walked through the open house, and another was hosting as estate sale, so we walked through that too. 16 homes in all; what a day! It took a solid three hours to get through all of the homes, and they were so very well appointed. The neighborhood is quite close to my grandparent's condo community, and I've never noticed it - so, it was fun to walk through and enjoy the leisure pace of a self-guided tour. A few of the homes in the Sunmor Estates neighborhood - just fantastic details, inside & out! The ones we went into were fabulous; this is just a portion of them. I took a lot of photos of their interiors, but my favorite was the home with various Charley Harper prints. Lots of fun pieces of furniture throughout made this a perfect Palm Springs home! And then there were the exteriors - most had pools, and some did not, but they were all lovely! The one on the left had various fruit trees - grapefruit, clementines, oranges and lemons; a citrus lover's dream. I would DIE to be able to go out and pick grapefruit for breakfast every morning. And that orange privacy wall on the right was a favorite of mine. I'd love to do something like this at our home in the coming years. This pool, by far, was my absolute favorite. 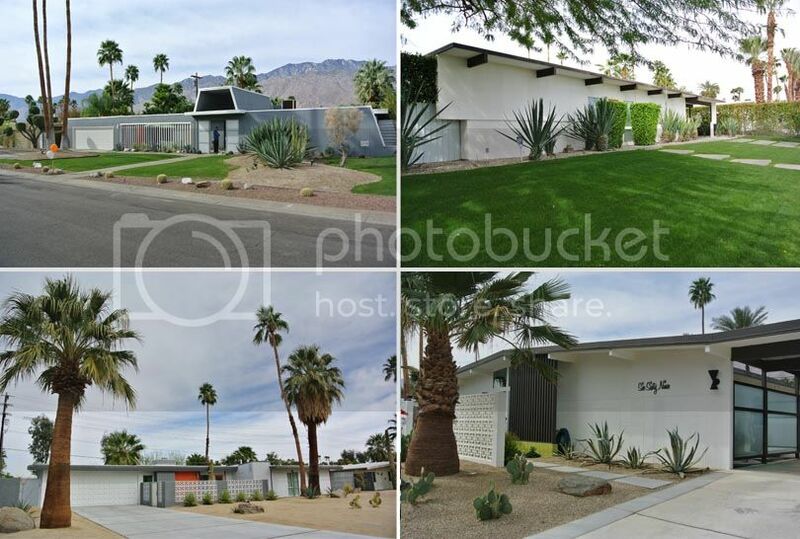 Of course, all that green grass in a luxury in the desert, but these homeowners spared no expense for the quintessential Palm Springs backyard. I can only imagine what it looks like after the sun sets over the San Jacinto Mountains - just magical I am sure! Sunday was a "down" day, and we relaxed. I laid by the pool at our condo, and in the afternoon, we headed out to Cabazon to do some outlet shopping. I found some killer deals on a few things I wish I would have bought when I was there last year with Greg. Namely, a snappy red Kate Spade purse. I am excited to carry it this spring! Monday was a busy tour day - we did the double-decker bus tour in the morning. Seeing homes from the top of the bus was awesome - a whole new view! 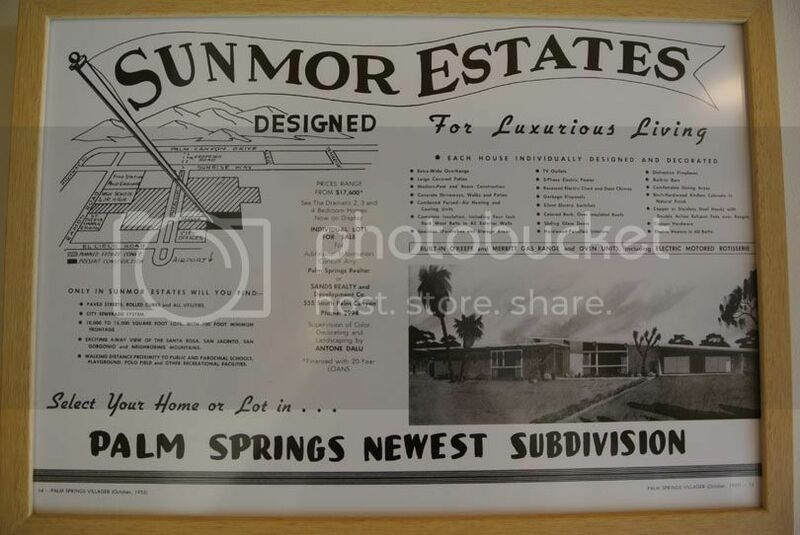 The photo on the right is the Dinah Shore Estate. This former gas station-turned-visitor's center is at the middle of the double-decker bus tour. Always a favorite with the dramatic roof line! After the bus tour, and lunch at Tyler's Burgers, we were finally able to see Frey House II. 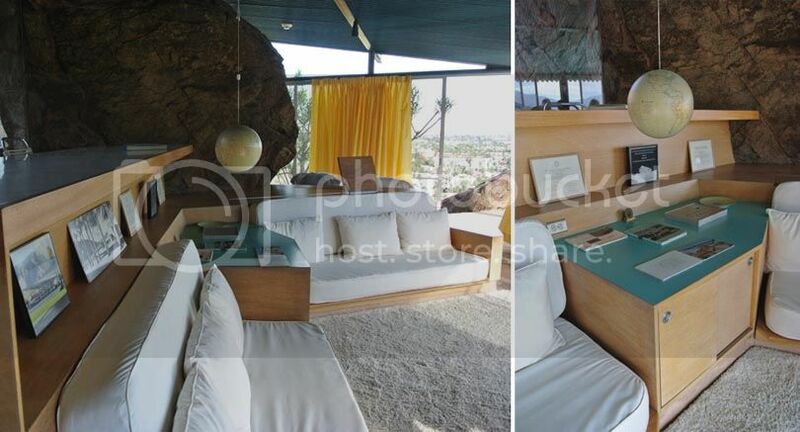 It's an incredible example of living on the Palm Springs mountainside and making things work within 800 sq. ft. of space. When you arrive at the top of the stairs, the pool greets you. 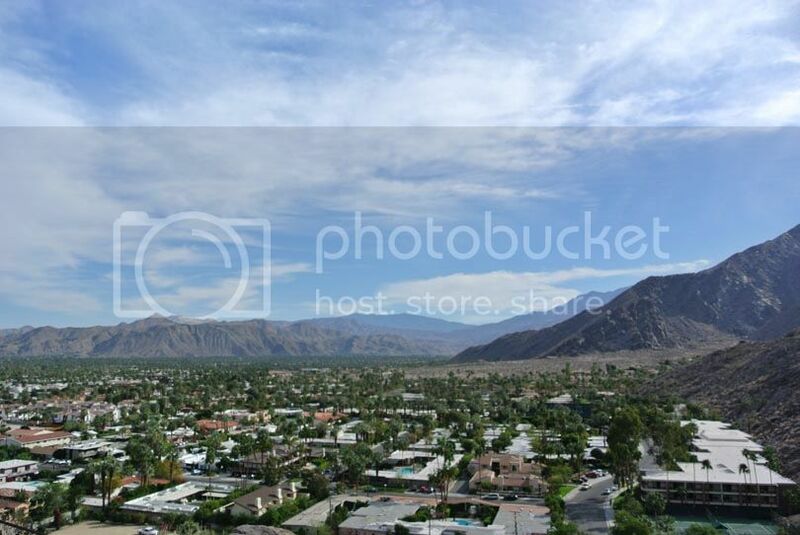 As well as the amazing views of the Coachella Valley. You step inside the door into the living room/dining room, and are mesmerized by all the use of glass and steel. The bedroom is directly to the right of the living room, and there are no interior doors in this portion of the house, so it's all open. 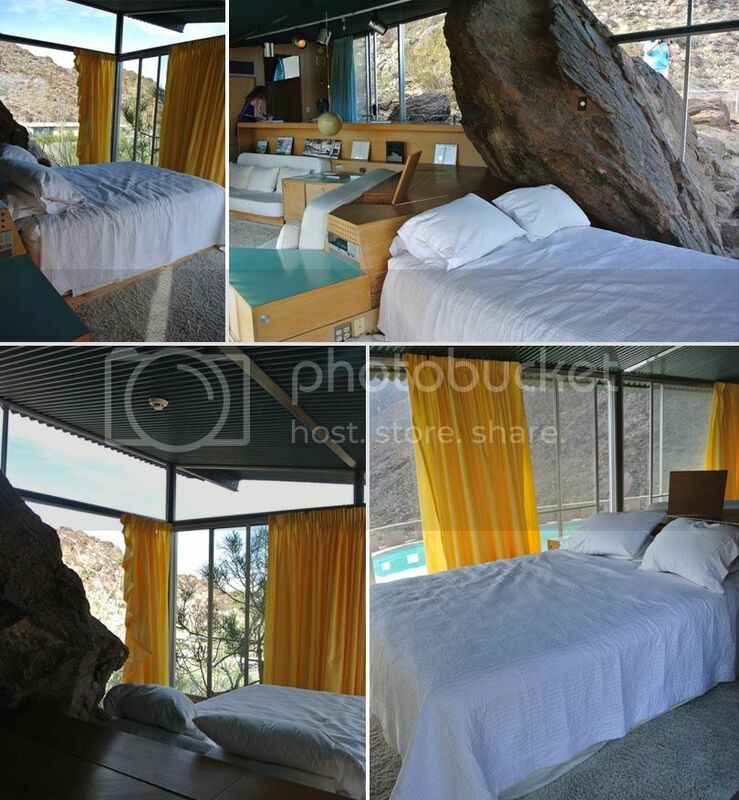 There are no obstructed views to speak of...except the boulder that Frey worked with - it creates a partial wall between the dining area and bedroom. Seriously brilliant. I am sure if you live here, you spend most of the time in the pool, right? The pool was actually built on top of the carport - I believe it's all cement. You'd park your car under the pool - crazy, eh? And here's the view from up there - rarely seen, as most people live down below. Afterwards, we went back to the Wexler Steel Houses to check them out on foot. We had seen them (quickly!) on the bus tour, but this time we got to creep on by and take photos. The one on the right is vacant, and by peeking in the windows, it does look like renovations are in process. And my final Modernism Week event was a cocktail party at the O'Donnell House to benefit Meals on Wheels. We arrived right on time, took a golf cart to the top of the hill, and enjoyed mingling and chatting with other mid-century modern-loving attendees. It was certainly one of the highlights! We grabbed a light dinner afterwards, and then headed back to our condo so I could pack the rest of my things, as my flight was the next morning. 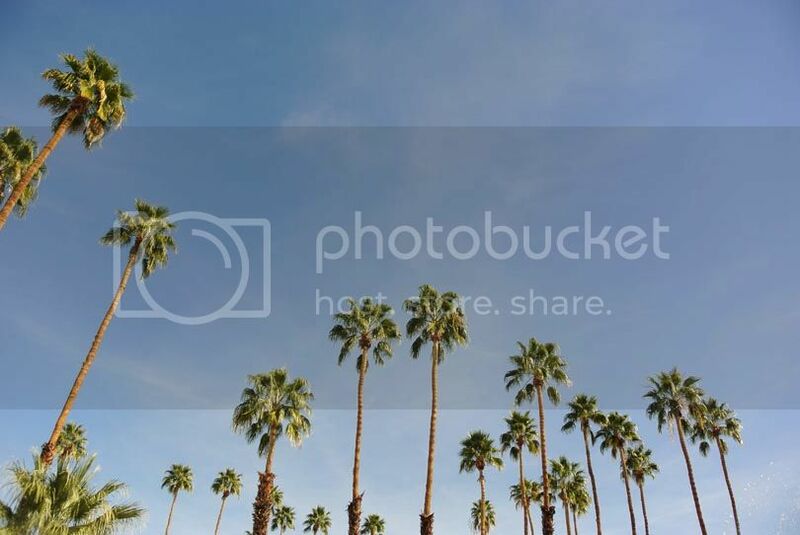 And I leave you with one of my favorite photos from the trip - palm trees for days! I wish they'd grow in Michigan - our home could use some sprucin' up this spring. 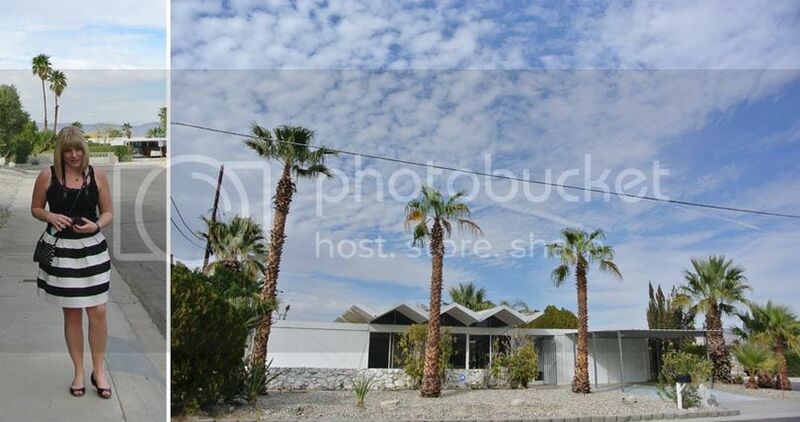 I highly recommend going to Modernism Week if it sounds like something you'd enjoy. It's a non-profit event, and the money raised goes back into the communities to continue preservation of the highest concentration of mid-century modern homes and public buildings in the world. It's phenomenal if you really think about it! I realize I am lucky to have family in town and usually end up finding a pretty good deal on airline tickets, but I would tell you to GO anyway! It can be quite overwhelming with all of the events, but a nice mix of events and one per day (maybe two if you have a short trip) has worked well for me both years I've attended. Now, back to the snow and cold I go!